After buying chicken dried meat yesterday, I passed by a pastry store. I bought a few pieces of pastries. There are quite a lot of nian gao displayed for selling. I took a few shots of nian gao for sharing with you. It's not easy to make nian gao. 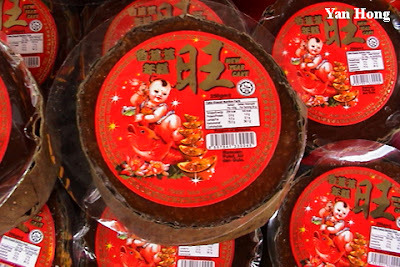 The ingredients of nian gao are glutinous rice and sugar. The glutinous rice must be soak in water for few hours before being ground into powdery paste. Put the powdery paste inside a flour sack. A heavey object has to be placed on the flour sack to press out the water. Mix the dried powdery paste with sugar. Pour the mixture into various sizes of cans. Each can is lined with a layer of banana leaf or plastic. Finally, steam the mixture in a big wok until it turns brown in colour. Chinese believe that by taking nian gao, children will be healthy, adults will be promoted in their profession and become wealthy. Nian gao also for serving kitchen god before the god returning to heaven. With sweet and sticky nian gao in mouth, the kitchen god wouldn't make any bad report about the family. This is the story of nian gao. It hands down from generation to generation until now. Do you think it's interesting ? Whoa.. I cant believe that you know how to make nian gao! Honestly, nian gao is nice to eat once it is done from steam. I still remember I can finished a nian gao after it took out. It really taste delicious...! Happy Chinese New Year and enjoy your nian gao. Whether fresh warm or cold harden, nian gao is tasty. Feel free to read my post "Nian Gao 02" for more detail.